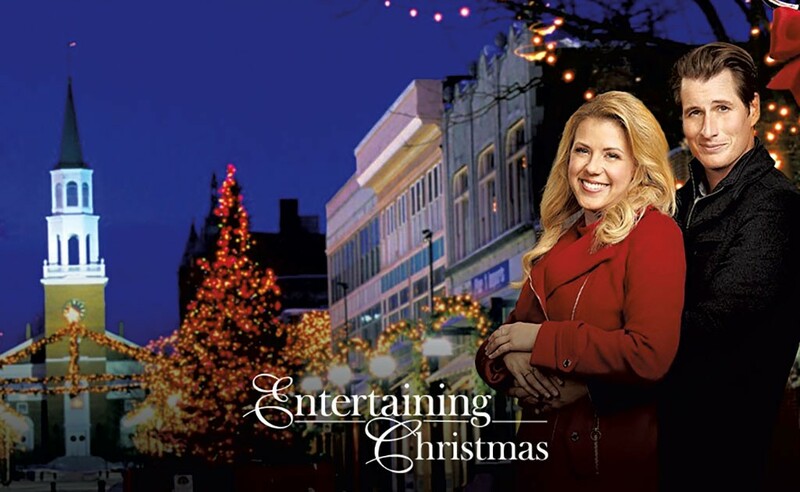 When the Hallmark Channel movie Entertaining Christmas premiered on Saturday, it brought millions of viewers to Cedar Falls, Vt. They watched a reluctant heiress to a cooking-and-decorating empire fall for a hunky news reporter. Online, promotional photos for the syrupy romance showed the perfectly coiffed couple in front of the twinkling Christmas lights on Burlington's Church Street Marketplace. Everything appeared just so. But the whole thing was a ruse. There is no Cedar Falls in Vermont, and the movie was filmed outside of Toronto. As for that Church Street pic? It was digitally altered. The backdrop probably dates to the early 2000s, according to marketplace executive director Ron Redmond. He based his assessment on where the massive Christmas tree is positioned. Hallmark, it appears, loves Vermont — but does not love to film in the state. The popular cable network has aired at least half a dozen new movies over the past 18 months that are set in the Green Mountain State but shot elsewhere. And while imitation might be the sincerest form of flattery, the sham scenes are demoralizing to local observers who want the state to host film crews and reap the benefits of the economic activity they generate. "It's very disappointing to me that they are not made in Vermont," Rutland filmmaker David Giancola said. He has a vested interest. Giancola produced what he believes is the only Hallmark movie in recent memory that is set in the state and was actually filmed here: Moonlight & Mistletoe. The Christmas nostalgia piece starring Tom Arnold was filmed in 2008 on location in Chester — and uses the southern Vermont town's real name in the script. It was shot in June, so the crew brought in truckloads of white carpet and plastic mounds to mimic snow — along with a wardrobe of Santa suits for Arnold. The production pumped at least $600,000 into the local economy, Giancola recalled. Since then, the director and producer has tried unsuccessfully to convince Hallmark to come back to Vermont. But "they just aren't going to," Giancola lamented. "The reason for that is two words: tax incentives." Vermont offers no film production perks, while other regions have made theirs more tempting over the past decade. Hallmark shoots many movies near Vancouver in western Canada. The region has been dubbed Hollywood North for its growing film and TV production industry, most of which has sprung up due to incentives. Last year, the film industry generated $3.4 billion in British Columbia, according to figures from the Canadian province. That explains why the streets of Langley, B.C., were featured in Moonlight in Vermont, and Agassiz, B.C., masqueraded as the fictitious Hopedale in Falling for Vermont. Burnaby, B.C., portrayed the Green Mountain State in Christmas in Evergreen. And that's just a sampling of recent Hallmark offerings ostensibly set in Vermont. "I just didn't know there were that many," Elaine Sopchak, special projects director at the state Agency of Commerce and Community Development, said after a Seven Days reporter read her the list. Hallmark isn't the first company to shoot a movie somewhere other than where it's set, Sopchak observed. The most notable example of this is perhaps the perennial holiday favorite White Christmas, a 1954 movie starring Bing Crosby and Rosemary Clooney. It's set mostly in fictitious Pine Tree but was filmed on a sound stage at 20th Century Fox in sunny southern California. That movie portrays Vermont as the capital of simple living, clean mountain air, buttermilk and industrious people outfitted in flannel. Sixty-five years later, the same G-rated nostalgic ambience pervades the Hallmark image of Vermont: Main Street shops are bustling, everyone's hair is brushed, and no one sports tattoos or face piercings. The characters are mostly white and straight. Trouble comes in the form of a broken-down car, a financially floundering inn or, most often, a broken heart. Even some fans of the films have criticized them in online forums, noting the absence of LGBTQ characters and the lack of diversity in casting and story lines. But the movies resonate with many. Last year, Hallmark made 21 holiday films and garnered 72 million viewers during its Countdown to Christmas blitz. That made it the highest-ranked cable network among women ages 25 to 54 during the year-end period. Perhaps sensing an opportunity, the company upped production this year, churning out at least 30 holiday flicks. Whether the heroines are struggling widows or successful professionals, Hallmark's Vermont seems to have an endless supply of eligible men with square jaws and broad shoulders. In one film, a retail exec returns to her Vermont hometown and charms a local contractor into helping her revive the ailing general store. Sparks fly — and not from power tools. So are all those Hallmark fans inspired to get off the couch and actually visit Vermont? Sopchak thinks the motion pictures probably drive some tourists to the state. "Christmas trees and snow and the holidays — that evokes Vermont for a lot of people," she said. These days, Sopchak is the state's point person for efforts to grow its movie and TV industry, a role that fell to her more or less by default. The state pulled the plug on the modestly funded Vermont Film Commission in 2011, after many local filmmakers said it had become ineffectual. It had die-hard defenders, though. They credited the commission with helping to bring big-budget films to the state. Two of those came out in 2000: the thriller What Lies Beneath, starring Harrison Ford and Michelle Pfeiffer, and the comedy Me, Myself & Irene, featuring Jim Carrey and Renée Zellweger. The drama The Cider House Rules, featuring Charlize Theron, Tobey Maguire and Michael Caine, hit screens in 1999. Loranne Turgeon was executive director of the Vermont Film Commission for about five years, starting in the late 1990s, and helped attract those big-budget productions to Vermont. Incentives were not as prevalent back then, she recalled. Because she had worked in the film industry, she knew all three of the producers for those projects. "I had a strong relationship with them; they trusted me," Turgeon wrote in an email from California, where she now lives. Back then, successful directors had more clout in picking a location. But with a few exceptions, budgets are now tighter. "Studios are so bottom-line-driven now, more than ever before," Turgeon wrote. "Even bigger directors haven't much choice." After the commission dissolved, it was supposed to morph into the now-defunct Vermont Office of the Creative Economy. That effort fizzled around 2014. In October, Sopchak organized a summit in Manchester for Vermonters who work in film and TV. Actors, directors, producers and camera operators showed up from all over the state. "There are dozens of very small businesses in the field," Sopchak said. As usual, some industry attendees urged the state to develop incentives such as rebates based on what a filmmaker spends locally, or a break on payroll taxes. Many also urged officials to resurrect the film commission, though Sopchak said that's not likely. The state would be more inclined to partner with or support a private council than re-create its own commission, Sopchak said. Incentives are under discussion but would be small compared to those offered in neighboring Massachusetts, New York and Québec, which all offer millions to filmmakers. "That's not something Vermont can do," Sopchak said. "We are waiting to see what the tone and temperature is going to be in the legislature this year," she continued. "We have had some discussion on tax incentives, but we are not sure whether we are going to pursue those." Vermont Secretary of Commerce Mike Schirling wants to first grow the overall economy so the state can afford film production incentives. In the meantime, he'd love to host a Hallmark crew so they can "see some of the great communities where they could come and film. "It would certainly be more authentic and, we think, create a better product if they were to actually film the movies in Vermont," Schirling added. Hallmark executives declined to comment for this story. But in reports for other publications, they have said the typical Hallmark movie is a low-budget affair that takes 15 days to film and costs $2 million to $3 million. That's peanuts by big-studio standards, but people such as Giancola would still love to see those dollars brought into Vermont. Over the summer, he stopped by a Hallmark movie set outside Woodstock, N.Y. One of the two films being made was Last Vermont Christmas. It was discouraging to again see that "Vermont doesn't play itself," Giancola said. His latest project is a low-budget sci-fi romp that will come out in the spring of 2019. It was filmed in and around Rutland for about $750,000 — money that he raised from investors. It's much more to his taste than the Hallmark movie on his résumé, he explained. "I don't think I've watched it since 2010, because it's just not my cup of tea," Giancola said. "That's the polite way to put it." Before Moonlight & Mistletoe aired, Giancola recalled attending a screening of it for movie buffs and extras at a Rutland theater. He was shocked when 900 people showed up. "Then, near the end of the movie, I noticed people were crying," Giancola said. "They were crying. They loved it. They were all over it, and I'm just going, 'I don't get it.'" So what attracts so many people to Hallmark's take on Christmas in Vermont? "I think we all want the holidays to not be what they really are, which is stressful and crazy," Giancola said. "It's that escapist thing."